Il revisionismo dei Residents colpisce ancora, e stavolta di venerdì tredici: completamente rinnovato da oggi il sito web ufficiale, con nuovi archivi, nuovi negozi, nuovi canali di comunicazione tra curiosi e appassionati e un nuovo bignamino ready-made a uso delle più giovani generazioni di studenti e biografi. Con un annuncio bomba: il ricostituirsi in quartetto - dopo la lunga stagione in trio di Randy, Chuck & Bob in qualità di Residents Cover Band - sotto sigla The Real (?) Residents. Il debutto è attesissimo a Tokyo, con sei concerti tra il 21 e il 23 marzo prossimi. 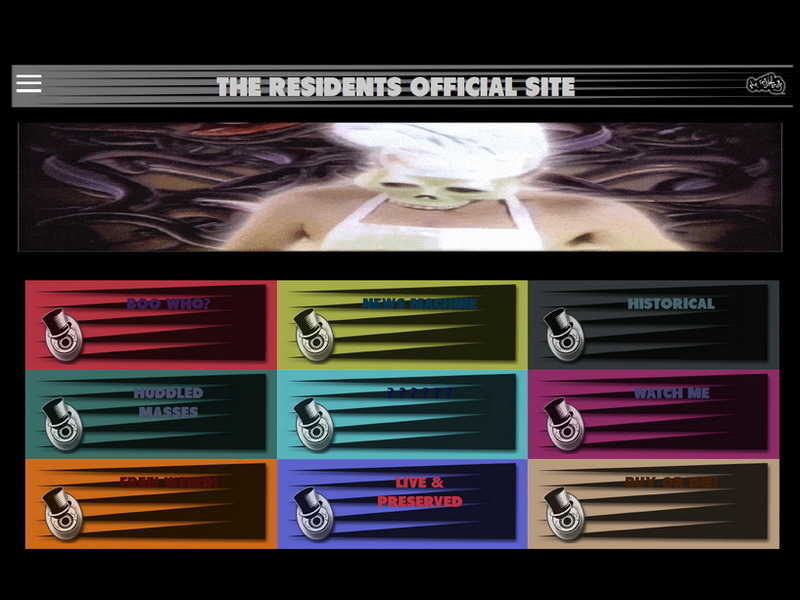 Alternately seen as a rock band, an arts collective and a spirit, The Residents have been regarded as icons in the world of experimental music for over forty years. In addition to their groundbreaking work in the areas of trance, world fusion, electronica, punk, industrial and lounge music, the group has also been credited with being among the originators of performance art and music video. Their early videos are in the permanent collection of the Museum of Modern Art and their Freak Show CD-ROM was featured in MOMA's "Looking at Music 3.0" exhibition. Their four decade long career has also taken them into the world of film and television music, having scored numerous films and TV series as well as several projects for MTV. In addition, the group is also thriving in the world of digital media having released ten DVDs, and two internet series. Recently, performing as Randy, Chuck & Bob, the group celebrated its 40th anniversary with a trilogy of tours: The Talking Light, Wonder of Weird and Shadowland. No longer content to merely impersonate a band, The Residents unexpectedly morphed into a power trio, gleefully plundering their vast catalog of music to the delight to their fans. Not content to rest upon their justly lauded laurels, the group is currently reforming as a four piece combo that will celebrate its debut at the prestigious Blue Note jazz club in Tokyo.